In volume 15:4, 1995 of Epiphany magazine (from the Christ the Savior Brotherhood, no longer in print), there is a story of a sad example of a missed opportunity that may have bridged the gap between African Americans and the Orthodox Church. In 1893, Bishop Daniel Payne of the African Methodist Episcopal Zion Church went to the Congress of World Religions at the World’s Fair. There he met Orthodox bishops and priest who told him that some of the most notable saints of the faith were Africans. No doubt, they told him of bishops such as Athanasius and Cyprian. Perhaps the monastics such as Anthony and Macarius were mentioned. Maurice of Thebes, Thomias of Alexandria, and other great martyrs may have also come up in conversation. 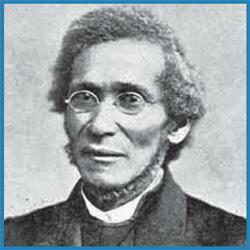 Bishop Payne, who was an abolitionist and educator was more than happy to hear that Africans were not late comers to the Gospel message and that the Diaspora can claim they are descendants of the first Christians. This could have been the first real bridge between African Americans and the Orthodox Church. Unfortunately, the Orthodox believers that Bishop Payne met with when he arrived back in the US refused to admit there were any saints from Africa. With no local encouragement to build a bridge, the ancient faith was kept from African-Americans. It can be said that the immigrant communities at that time had a hard enough time making their way in this country and that trying to evangelize to blacks at the dawn of Jim Crow America didn’t seem to be an inviting prospect. Except for the Russians in Alaska, the Church wasn’t very well organized. As palatable as these excuses may be, the fact remains that this missed opportunity all but shut the doors between the two communities for 100 years. After having the doors closed in his face, I doubt if Bishop Payne made any real effort to study the ancient faith. Missed opportunities also happened closer to home in our modern time. For many years, the ROCOR turned OCA mission parish St. Cyprian of Carthage in Richmond was only a few blocks away from historically black Virginia Union University with its well respected School of Theology. While I am not sure about their efforts in evangelism, St. Cyprian’s iconostasis depicted Christ Panocrator and the Theotokos as light brown skinned and on either side were the full sized icons of the patron and St. Moses of Ethiopia as undeniably black men. With the interest in Afro-centrism, the location and name of this church should have attracted inquirers and converts from the African Diaspora among the college and seminary students as well as the local communities. Unfortunately, few African-Americans were curious enough to visit. Those who did didn’t become catechist and converts. Admittedly, Orthodox Christianity is very challenging for even white Protestants. It wasn’t that long ago that blacks made great strides in Civil Rights with the support of the black church. Thus, it seemed that investigating the Orthodox Church seemed unnecessary. Reasonable excuses these may be. However, to ignore the 2,000 year old witness which included African saints, imagery, prayers, and wisdom for the sake of maintaining the comfort in 200 year old expressions that came from Catholic and Protestant slave masters is a bit inexcusable. Even modern Sub-Saharan Africans are attracted to the fact that Orthodoxy is not the faith of their former European colonial masters. While St. Cyprian still exist and welcomes all people to come and worship, the church is located along the border of Chesterfield and Powhatan Counties, away from the predominately black city center. Only with open doors and open minds can the Orthodox Church (Eastern and Oriental) bring the ancient voice of salvation to African Americans. The effort of opening is the responsibility of both sides of the equation. All it takes is the courage to act and not let the opportunities for understanding pass us by.